In early February, nearly 350 delegates from many parts of the globe came together for the 13th Annual Active Living Research Conference in Clearwater Beach, FL. Consistent with previous years, nearly half of the attendees were newcomers – indicating the continued growing interest in active living. The conference theme Equity in Active Living challenged all participants to move out of our comfort zones and embrace diversity as a pathway to equity. Although we admitted that most of us experience maximum comfort in homogenous groups where there is trust and social cohesion, we also acknowledged that diverse groups perform better. The conference began with my fellow conference Co-Chair, Jim Sallis, challenging us to engage with 20 new and diverse attendees who came from the varied sectors and geographic locations. In the conference opening attendees heard about differentiating between equality and equity. I presented a popular graphic – popular because two other, unrelated speakers presented the same graphic on subsequent days. 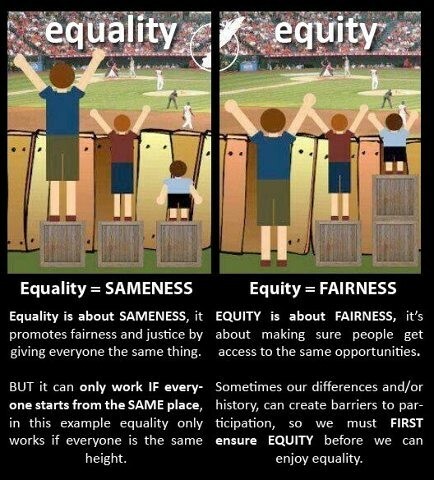 The graphic indicates, “Equality is about sameness, it promotes fairness and justice by giving everyone the same thing.” That can only work if everyone starts from the same place. “Equity is about fairness. It’s about making sure people get access to the same opportunities.” Sometimes our personal, demographic, or sectoral differences can create barriers to access and participation. So we must first ensure equity before we can enjoy equality. That theme reverberated throughout the conference. On Monday, the Keynote speaker, Julian Agyeman, PhD, FRSA of the Department of Urban and Environmental Policy and Planning at Tufts University, delivered an energizing and motivational talk about environment and social justice. On Tuesday we heard how community organizations could impact equity in active living from Jim Rimmer of the Lakeshore Foundation, Nedra Deadwyler of Civil Bikes, and Karen Showalter of Mom’s Rising. On Wednesday, a thought-provoking panel discussed Using Policy to Influence Equity in Active Living with presentations from Olivia Roanhorse of the Notah Begay III Foundation, Ian Thomas of America Walks, and Caron Whitaker from the League of American Bicyclists. The rest of each day was filled with a variety of policy, practice and research presentations with plenty of opportunities to learn, give feedback, and network. Monday ended with a poster session where attendees were able to vote for our favorite posters. Congratulations to Melissa Fair of the University of South Carolina, Alireza Ermagun of the University of Minnesota, and Sungmin Lee of Texas A&M University. We had three formal activity breaks during the meeting - two involved dancing and the third offered a variety of activities from which to choose. I selected walking on the beach accompanied by a lively discussion with Mark Tully of Queens University in Belfast. I learned about education and politics from across the pond and what they think of us Americans. During one evening many of us even had the opportunity to participate in an impromptu session of combined salsa and African dancing. Clearwater Beach was a new location for ALR on the opposite end of the US. We were glad that our international guests were greeted with the Florida coast sunshine. The food remained amazing and the fellowship was what I expected from my ALR family – warm, friendly, and meaningful. Congratulations to all of us who rose to the challenge, moved out of our comfort zones, and met 20 new people. As the other Conference Co-Chair, I am thankful to the Program Committee for sorting through a record number of abstract submissions that led to another top-notch ALR meeting. I appreciate the presenters and other attendees for their high level of engagement and rich comments during the sessions and at the Town Hall Meeting that concluded the conference. I am grateful to our conference partner, Elsevier and exhibitors and sponsors. But mostly I am grateful for the dedicated and superior ALR staff – Carmen Cutter, Chad Spoon, Amanda Wilson, and Deb Rubio under the visionary leadership of Jim Sallis for making such an amazing event possible. I am so excited to participate again next year and hope to see you there.